You are here: HomenextPeoplenextFamily MemoriesnextMemories of "Le Friern"
My aunt and uncle, Ethel and George Burton lived in Laindon from mid to late 30s until their bungalow was demolished, one of the last, I believe, as she fought tooth and nail to stay. The address as I remember was ‘Le Friern’, Westfield Avenue, Victoria Drive, Laindon, and I spent many happy hours with them. They collected drinking water from a standpipe, and used oil stoves for cooking until they were eventually connected to electricity, a real luxury for them. Ethel was quite a well recognised character in her wellies and woolly hat pushing her wooden box on wheels to the local shops. It was quite a distance. They had two white fluffy dogs during the war years called ‘Doodles’ and ‘Bugs’. George worked at Murex in Rainham and travelled in each day on his motorbike and sidecar, and would often collect me and take me back for a weekend break, otherwise we would get a bus to the Fortune of War, then walk down to the police station on the corner of Victoria Road turn right and when the road came to an end, there was a row of single paving slabs. Eventually we would turn into a field with a couple of bungalows on either side and Le Friern was the last one at the end on the left. I remember one particular place we passed was called ‘Ki Ora’ which they always said was New Zealand for something, I don’t remember what. I have often tried to find some record of what became of the land they were on. It was supposed to have been going back to agriculture, but the whole area is now completely unrecognisable. I read your article in the Yellow Advertiser, and tore it out, but mislaid it, so I don’t know if this is still of interest to you. 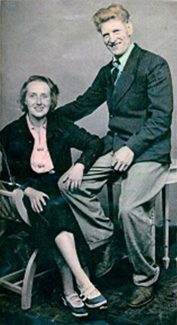 Ethel died late 50s or early 60s and was buried in Dunton Churchyard, and George was rehoused in Basildon somewhere, living to a good age. 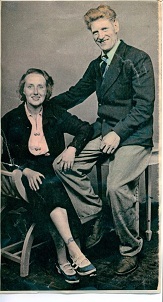 I have an old snapshot of myself aged about 3 or 4 taken while the building of the bungalow was being carried out, and also a studio photo of Ethel and George, if they would be of any interest. I would love to know if anyone out there remembers them.